JERUSALEM -- A divided Israel marked the first anniversary Thursday of the assassination of Yitzhak Rabin with an impassioned call from Prime Minister Benjamin Netanyahu for unity and an emotional graveside ceremony. 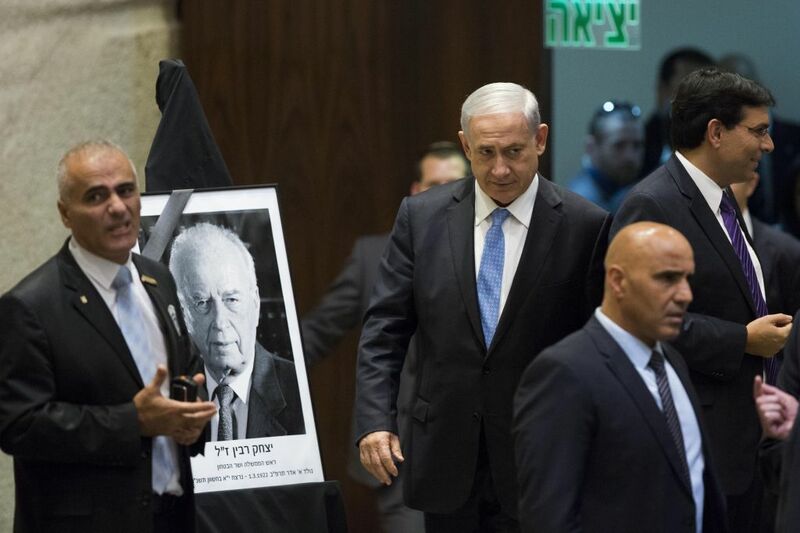 ``The murder of Yitzhak Rabin must remind us of a basic truth: peace begins at home,'' Netanyahu, accused by Rabin's widow of fostering an atmosphere of hate that led to his assassination, told a memorial session of parliament. ``The choice before us today is to seal the rift and unite or widen the division and disintegrate,'' the hard-line leader said. Israelis marked the Jewish lunar calendar anniversary of Rabin's assassination by a right-wing religious Jew opposed to his peace policies with the Palestinians as divided as they were on the eve of the murder Nov. 4, 1995. Two dovish legislators, Dedi Zucker and Dalia Itzik, walked out of the session as Netanyahu got up to speak. ``Mr. Netanyahu was directly, personally (part of) the deepest incitement that was directed toward Rabin. He never said 'Sorry, I made a mistake','' Zucker told reporters, referring to the Likud party leader's attendance at right-wing rallies at which Rabin was called a traitor. In Tel Aviv, thousands of people streamed to the public square where Rabin was shot dead a year ago by a religious Jew opposed to his peace policies with the Palestinians. They lit memorial candles and wept. Schoolchildren marked the killing with a moment of silence. Family members and Israeli leaders across the political spectrum gathered at the gravesite on Jerusalem's Mount Herzl for a state memorial. Friends and family wept. ``I want to ask your forgiveness, Grandfather. A year has passed and nothing has changed. It appears nothing has changed,'' Rabin's grandson Yonatan Ben-Artzi said in a speech. Leah Rabin spoke on a phone moments before the ceremony began. Israel Television said it was a call from President Clinton. But sparring between left and right continued unabated over the peace process Rabin embodied and the fate of Israeli-occupied land. A procession of religious and right-wing cabinet members, who took office in June on a platform opposed to Rabin's policies, laid wreathes on the grave but only family members spoke at the ceremony. It was in sharp contrast to the funeral last year which attracted scores of world figures, including Clinton and Arab leaders drawn to the man who paid with his life for his peace policies. ``The murder did not succeed in creating a common experience for all of the public. On the contrary, each side became more fortified in its position,'' the newspaper Haaretz wrote in an editorial. 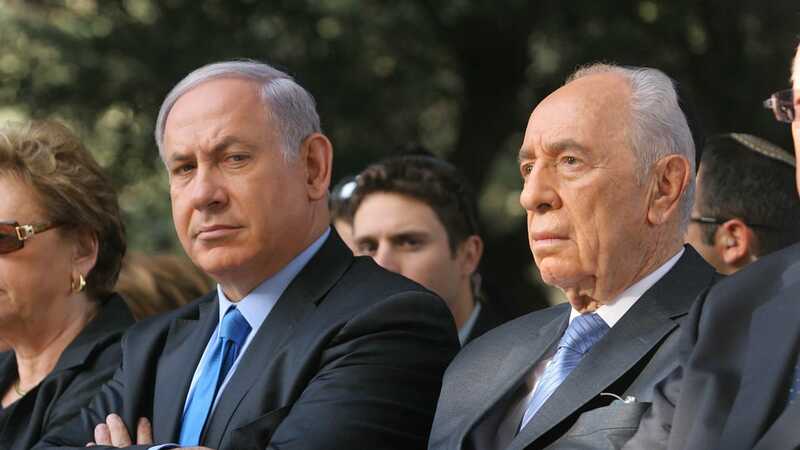 Israel Television said Wednesday Netanyahu and dozens of legislators had received death threats in recent weeks, including opposition leader Shimon Peres, who shared the Nobel prize with Rabin for their 1993 peace deal with the Palestinians. Netanyahu defeated Peres in elections last May by fewer than 30,000 votes. The landmark peace deal with Palestinian leader Yasser Arafat made Rabin, a former war hero, a traitor in the eyes of some right-wing Jews who view the West Bank as land promised to the Jews by God. Another event Thursday served as a reminder of the work that remains to be done, however. Police shot and wounded a Palestinian near Tel Aviv on Thursday, saying he fled a securitycheckpoint set up to prevent anti-Israeli attacks to mark an Islamic leader's assassination. When police at the Morasha junction discovered that the man, one of five Palestinian workers in a van, had forged identity papers, he fled for a field and refused their order to stop, they said. Police shot and seriously wounded him. Israel was on high security alert ahead of the October 26 anniversary of the killing of Fathi Shqaqi, leader of the militant Islamic Jihad group behind suicide attacks in Israel. Shqaqi was gunned down in Malta last year in what Palestinians believe was an attack by Israel's Mossad secret service. The militant group vowed to avenge his murder.